When you think of the word “detox,” you likely think of diets that aim to build your immune system and take out all of the toxins in your body. An emotional detox is the cleansing of the mind and heart. This detox is important for those that put other first. 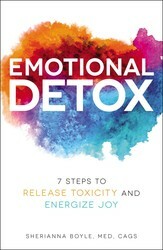 Reclaim your mind with help from Sherianna Boyle, author of EMOTIONAL DETOX. Most of us view a detox as a physical experience—a way to remove all the impurities acquired through daily living. What we don’t realize is that it’s not just our physical bodies that need to be cleansed in order to return to a healthy state. When we’re unable to process our own emotions and they become toxic to ourselves and those around us, it’s time for an Emotional Detox. This practice will guide you through the seven steps of C.L.E.A.N.S.E, and put you on the path to a happy and fulfilled life! Emotional Detox is a much-needed reset for the soul. Thanks for your support! Cleanse your mind with meditation. Excerpted from Emotional Detox by Sherianna Boyle. Copyright © 2018 Adams Media, a division of Simon and Schuster. Used by permission of the publisher. All rights reserved. Flush out negativity and clear a path for new positive habits, behaviors, and emotions with certified energy healer, yoga instructor, and psychology professor Sherianna Boyle’s emotional detox program, C.L.E.A.N.S.E.When we think of a detox, we usually think of a physical experience. But it’s not just our physical bodies that need to be cleansed of the impurities we encounter and absorb in our daily lives—it’s our minds too. When we find ourselves unable to process our negative emotions and feel them becoming toxic to ourselves and those around us, it’s time for an Emotional Detox, a mindful and systematic guide to freedom from these troublesome feelings.